Scarborough and other towns in the Borough will host a number of events and activities in the run up to this year's Armistice Day. 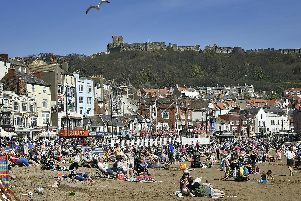 Collectively known as ‘Yorkshire Coast Remembers’, the commemorations will culminate with a special evening of remembrance in Scarborough on Saturday 10 November, which will start with a community lantern parade followed by a grand ‘Royal Albert Hall’ style centenary service in the Grand Hall at Scarborough Spa. As part of the parade, 100 illuminated poppy lanterns will be carried from the Grand Hotel on St Nicholas Cliff at 5pm to Scarborough Spa in time for the start of the service at 6pm. The parade will include standard bearers, veterans, cadets and members of the community involved in decorating the lanterns. Workshops to make and decorate pop bottle lanterns to add to the spectacle of the parade will be held on Saturday 20 October, from 10am until 12pm at Scalby Library, and from 1.00pm until 2.30pm at Scarborough Library. The free workshops are open to all, but families are particularly encouraged to take part. Participants are asked to bring a clean two litre pop bottle with them to help with materials and recycling. The evening centenary service will pay tribute to all those who served in WWI and those who lost their lives in combat or as a civilian. The service will include performances by the York and Dishforth Military Wives Choirs, Tony Peers Singers and Scarborough Concert Band. The audience will be made up of invited guests from the Armed Forces and veterans community as well as representation from the borough’s youth and voluntary groups and organisations. To complete the audience, tickets are also being made available for general public release from 9.00am on Saturday 6 October from the Scarborough Spa Box Office, either online at scarboroughspa.co.uk or by calling 01723 821888. The tickets are free and can be printed off by purchasers that have access to a printer at home. An administration fee of £2.00 per booking will be made for tickets collected from the box office or £2.50 per booking for tickets posted to the purchaser. Already underway to mark the centenary is ‘Stories of Remembrance’, a community project commissioned by Scarborough Borough Council and delivered by Animated Objects Theatre Company. They have created three life size wire sculptures of a lone soldier, one each for Filey, Scarborough and Whitby, standing among fields of textile poppies, created by members of the local community, schools and groups. The sculptures will be an integral part of each of the three towns’ Armistice Day services after which time they will go on public display for a month in Filey Library, Whitby (location still to be confirmed) and Scarborough Customer First centre. People from across the Borough of Scarborough have been attending poppy making workshops and making poppies at home for a number of weeks as part of the project with representatives from The Royal British Legion, Girl Guides, Cub Scouts and Age UK also involved. There is still time for anyone who would like to contribute, to attend the final ‘sewing bee’ workshop on Saturday 13 October from 10.00am to 4.00pm at Woodend Creative Space in Scarborough where the poppies will be sewn onto the fields.